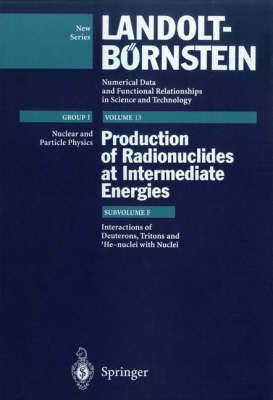 The precise knowledge of production cross sections for specific radionuclides for medium energies (10 MeV to 100 GeV) of the incident particle gains ever more importance, not only for nuclear physics but also for many applications, e.g. astrophysics, radiation protection at accelerators but also on space flights, radioisotope techniques in medicine and for industrial applications and perhaps even for the removal of nuclear waste by accelerators. Since the last systematic review of these production cross sections in 1973 (LB I/5a, b, c) an impressive amount of new experimental data has been accumulated. In the present subvolume data for the production of radioisotopes by medium energetic deuterons, tritons and 3He-nuclei on various targets are presented in tables and figures, the latter showing the general trend of the cross sections and can be more readily used for interpolations. The origin of the authors made it possible to include data from the former USSR and other East European states which sometimes are not easy to access. The tables and figures have been compiled with extraordinary care and should present the most complete compilation for this type of nuclear reactions.